I’m Jo and I’m one of four girls in my family. Being the middle child, I think, has made me very self-sufficient and independent. And I also got away with a lot of things because I slipped under the radar! I’m married to a wonderful man with a beautiful and giving soul, and I have two vivacious and inquisitive kids whose zest for life and exploring is definitely rubbing off on me. And there’s our ancient 18 year old feline friend, aptly nick-named The Dowager. I’ve watched my mother sew all her life. I remember wearing pillowcase dresses and kimono style night gowns, all lovingly made by her. But it was my father who taught me how to sew on a sewing machine. That started my love affair with sewing. I am self-taught and picked up my second hand Husqvarna sewing machine 4 years ago. Encouragement from friends and family spurred me on to start my handmade business, and so One Busy Sloth was born in March 2013. I make all kinds of bags - cute little pouches, eye-candy totes, cross-body slings that I can never do without; gorgeous handbags and hard-wearing backpacks that took us across Europe When I first started making bags, I worked mostly with quilting weight cotton, but in the past 18 months find myself working more and more with heavier weight furnishing fabric for a sturdier form. I love the endless choices of printed fabric available in the market. I’m a bit of a colour fiend – I’m not afraid to experiment and combine very strong prints and colours. I see harmony in clashing colours but I also like the simple and clean lines of Japanese and French designs and aesthetics. I love browsing all kinds of craft books, but my favourite is Lisa Lam’s The Bag-Making Bible. I learned most of my fundamental bag making skills from this little gem. I’m not fond of using a bought pattern but when I do, I always tweak it to make sure the bag doesn’t just look good, but is functional with practical pockets in all the right places. I’m a very visual person, so anytime an idea or a design pops into my head, I have to put it on paper straightaway. I carry a little diary with me that also serve as a “design inspiration” book. I have a notebook in my bedside drawer too for those late night inspirations that simply cannot wait till morning! I only started crafting as a hobby after my second child was born. My first attempt at craft of course started years ago in my early teens, when I took up cross-stitch. I still have the cushion cover with the cross-stitch tulips on my couch. It’s looking a bit sad but I can’t bear throwing it out. It’d be interesting to see if I’d still have it in another 20 years! My business name, One Busy Sloth, is picked for its playfulness – an oxymoron; but it is mainly because as a child, I was always a bit laid-back and quite happy to do as little as possible, a bit sloth like, you can say. As a grown up, I cannot sit still. I love busy. Since I’m a visual type, I like looking at books, any kinds of books that involve making and creating. And my collection of craft and sewing books is getting a little too big for my bookcase! I also find Pinterest a very useful place to get some design ideas. 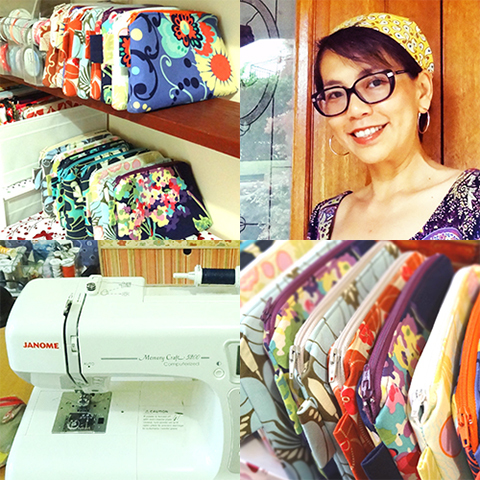 On a social level, I’ve been very lucky to have formed friendships with other bag makers, and we are all very happy to discuss and share our resources and information with each other. I’ve also been very blessed to be taken under the wings of a group of ladies who are much more experienced in the handmade world early on when I first started. I learned most of what I know now about social media interaction and networking from this group of beautiful women. This has probably been said a thousand times, but I would say – do not expect success overnight. The handmade world is getting more congested everyday, and it takes time for your business to be discovered. Personally, I don’t set long term goals as I find it too daunting. So taking little steps is what I like doing – whether it be product designs or sales goals, I like to set short term goals. Then it becomes a lot more achievable. And be prepared for some hard slog and setbacks along the way. It’s all part of the journey, so learn to accept it, take a lesson from it, and keep on moving! I don’t advertise all that much, probably about 2-3 times a year. I find interacting on social media a much better way to gain brand exposure. But you have to be consistent – that means regularly posting and interacting with your followers. Networking with other businesses is also an effective way to gain traction for your business. Remember that other business owners are consumers too! I can’t say I’ve learned a hard lesson so far. What I do struggle with is not knowing when to step away from the laptop and just call it a day. I think I am getting better in organising my time, but I can still work on spending less time online and more time making! I love reading fiction books, though I’m finding less time these days to read regularly. Music is a big part of my crafting. There’s always music playing in the background while I sew. In fact, there’s always music playing in the house. We are a very musical family, and the kids love playing the piano and singing. I’m also an avid cook and baker. Followers of my business page would very often see my adventures in the kitchen. It’s all good fun and sometimes, I think my food posts get more interactions than my bag posts! I’m a big fan of jazz music, but I can’t say I have a favourite genre. I also have a soft spot for French pop – might have been that trip to Paris a few years ago! At the moment, I’m watching last season’s Game of Thrones. Movie wise, I like action ones, and not a fan of romantic tearjerker movies. I’m getting through Hugh Howey’s Silo series, starting with the first book “Wool”. It’s part sci-fi, part thriller, which surprised me as I never thought I’d like reading science fiction. It’s riveting reading and has kept me up way past my bedtime on many occasions! I follow blogs from Anna Maria Horner and Lisa Lam. I also follow Alicia Paulson, whose embroidery work is out of this world, not to mention her food posts are so scrumptious! Both Anna Maria Horner and Alicia Paulson write so eloquently, and their photography is always stunning and moody. It’s a real treat when I have the time to catch up on their blog posts. That would be reading a good book while sitting on a chaise lounge in the sun. And having all my meals cooked for me. And no washing up duty after! Nicole Barros - for her vibrant, life-like and definitely stunning art work.